Go to the detail page for the book you want to order. In the lower section there is a gray box from which the book can be ordered. 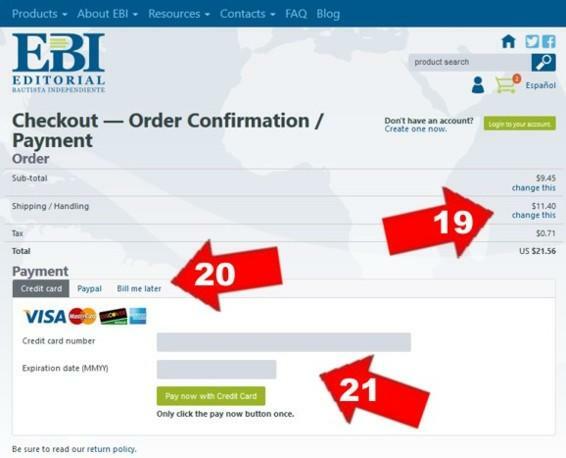 If you have ordered from EBI before and established an account you can log in. (9) Any special pricing associated with your account will be reflected in the shopping cart totals. To finish the order click on the "Checkout" button in the lower right corner. Billing and shipping information is entered on the customer information page. All fields that have a small * after the name must be filled. Please provide your e-mail address and phone number so that we may contact you regarding any questions concerning your order. The EBI account number is the one that appears on your invoices if you have ordered from EBI before. Some address fields are important even if they are not required. 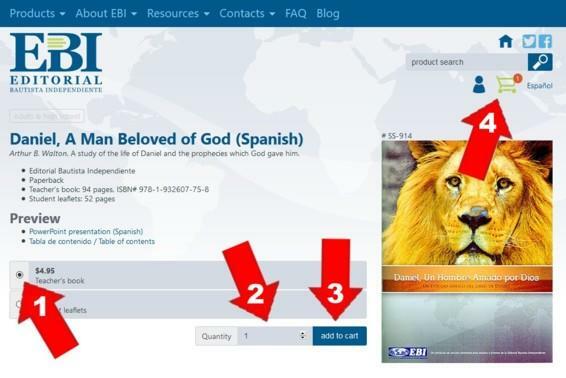 The "Company" field identifies the name of your church, Bible institute or bookstore. The "Address 2" field provides additional spacing for those who have long addresses. The zip code field is vital for all USA addresses and any foreign addresses with postal codes. Click on the "Save my information for future use" box (13) if you want to save your customer information for a future order. If you click this selection and click on the "Proceed to next page" button (14) at the bottom of the white information area, you will be transferred to a new page to create an EBI web page account. You will need to add a password to the information you have already entered so that you can retrieve that information in the future. 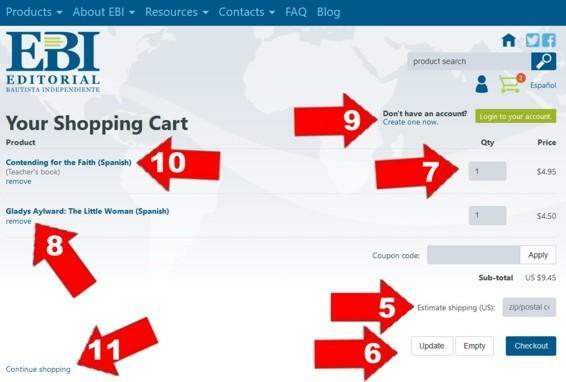 If you are an established EBI customer and want to be billed for your web site orders, you will need to create an EBI web page account. 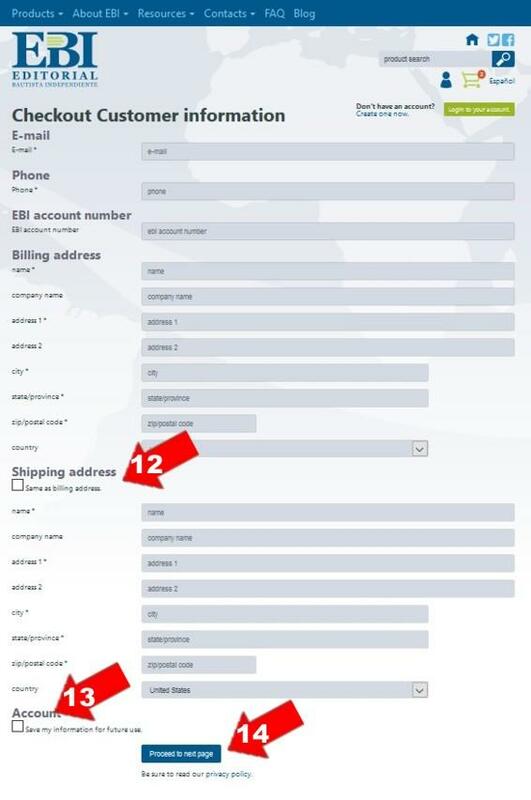 If you do not click on the "Save my information for future use" box (13) and then click on "Proceed to next page" button (14) at the bottom of the white area you will be transferred to shipping selection page. The customer shipping address is displayed on the left hand side of the shipping details page. (15) It is imperative that you double check the accuracy of you shipping address! If the address is incorrect then click on the "change this" link and you will be able to correct the address. On the right side is a list of the shipping options that are available with United Parcel Service (in the continental United States) and the US Postal Service. (16) All orders over $100 which are shipped to addresses in the continental USA are sent by UPS. All orders shipped outside of the continental USA are sent by USPS. UPS is more easily tracked and arrives more consistently at the scheduled time. The delivery time for ground service varies from 1 business day for the southeastern United States to 6 business days for western states. USPS media mail is often the most economical shipping method in the USA. It is advertised that all deliveries will arrive within 7-10 business days, but service is not always reliable. Additionally packages cannot be tracked. Select your preferred shipping method by clicking the round circle. (16) Click the "Proceed to order confirmation" button (18) to continue to the order confirmation page. The order confirmation page contains a summary of the total cost of books, sales tax and shipping. (19) Please review these numbers! Sales tax is collected on all books, except Bibles, which are shipped to a Florida address. If something needs to be changed you can select the "change this" link. If you selected "Credit card" enter your card number and the expiration date. (21) Click on the button "Pay with credit card" to pay. Only click this button once or you will be charged twice. 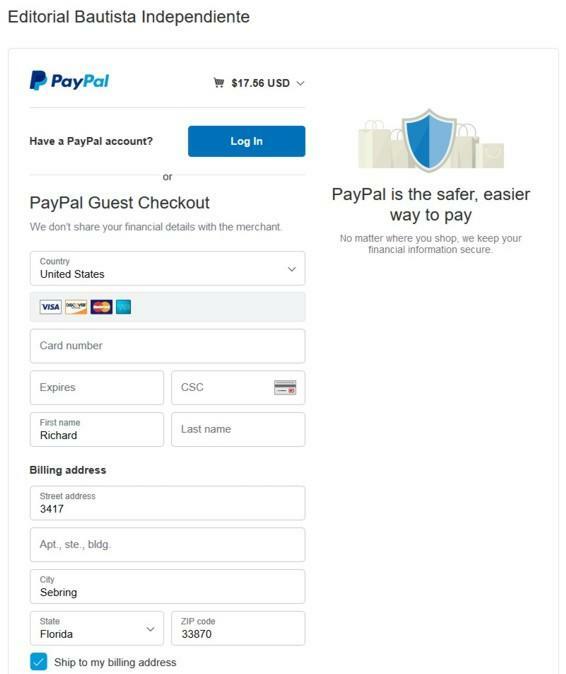 If you selected the "PayPal" option you will be transferred to another page where you have to click the PayPal button which will transfer you to the PayPal web site which should look something like this. On "PayPal" you can pay with a credit card or your PayPal account. 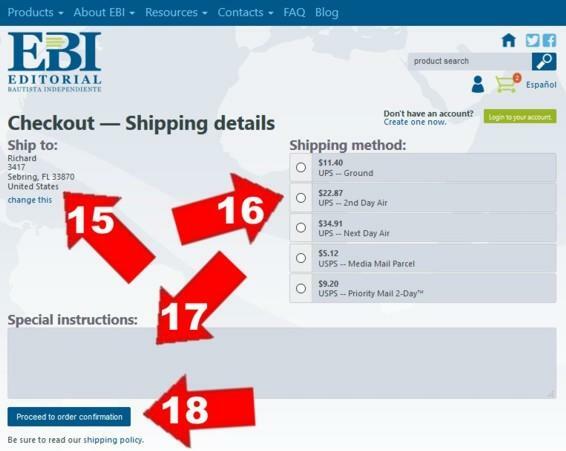 If you have ordered from EBI before and have a website account you will also have the option "Bill me later" which means EBI will send you an invoice. 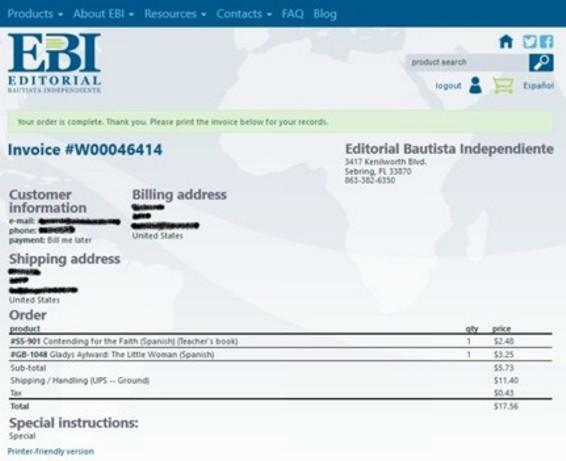 In order to pay from an invoice, the established customer’s web site account needs to be modified by EBI. The established customer should create their web site account and then contact EBI by phone (800-398-7187 or 863-382-6350) or e-mail (info@ebi-bmm.org). The web site account will be flagged and you will then have the option of paying by invoice which will be mailed or e-mailed to you. When you have completed your transaction you will be shown an invoice. Please print this page for your records. You should also receive a copy by e-mail.